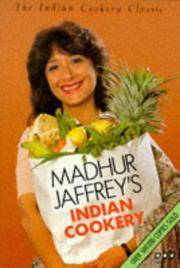 Anonymous (Clifton Beach,QLD): Madhur Jeffrey's Indian Cookery ISBN563164913 (paperback) ISBN 563165731 (Hardcover) This a book that I would highly recommend for anyone who loves Indian curries. The book is one of a series of books that Madhur Jeffrey wrote for the BBC . Madhur, an international authority on food was born in Delhi, India and in this books shares her knowledge as to how to make authentic Indian food. There is a wide selection of recipes that are explained in simple terms and easy to follow. The ingredients she uses are readily available in Australia. Cooking recipes from this book is on par with going to a very good Indian Restaurant. I highly recommend this book. Random House, 2002-11-07. 2nd. Hardcover. Used:Good. London: BBC Enterprises Ltd/ The Hamlyn Publishing Group. Purple boards with yellow lettering on face and spine. Orange end papers. Binding is tight and square. Light wear to spine ends and corner points of boards. Pages are clean throughout. The dust jacket has two closed tears at top of spine, otherwise in great condition. Based on the BBC Television series with writer and film star who has an almost encyclopedic knowledge of the food of her native country. Every recipe is illustrated in full color. . Very Good. Hardcover. 1989. BBC Books. Hardcover. 0563488212 . Very Good. Random House. Hardcover. 0563488212 Book is in very good condition. -- Re-Read is a social enterprise that trades in and recycles books to reduce waste, save them from landfill and provide services and activities that promote literacy, education attainment and quality of life in South Yorkshire and supports Askern Community Library. All overseas shipping is via Airmail. . Very Good. 2002. Random House, 2002-11-07. Hardcover. Good. BBC Consumer Publishing. PAPERBACK. 0563164913 Book is in good condition. Discolouration present. Creasing present. Fingermarks present. Cover has some wear. -- Re-Read is a social enterprise that trades in and recycles books to reduce waste, save them from landfill and provide services and activities that promote literacy, education attainment and quality of life in South Yorkshire and supports Askern Community Library. All overseas shipping is via Airmail. . Good. 1982. London, United Kingdom: BBC Worldwide, 1987. Trade Paperback. Very Good. Cooking and Food Writing Clean copy with light scuffing to covers only, interior/text is clean and bright. 200 pages. BBC Books. Paperback. Used; Good. Stains on Side **WE SHIP WITHIN 24 HRS FROM LONDON, UK, 98% OF OUR ORDERS ARE RECEIVED WITHIN 7-10 DAYS. We believe you will be completely satisfied with our quick and reliable service. All orders are dispatched as swiftly as possible! Buy with confidence! BBC Books, 11/07/2002. Hardcover. Used; Good. **WE SHIP WITHIN 24 HRS FROM LONDON, UK, 98% OF OUR ORDERS ARE RECEIVED WITHIN 7-10 DAYS. We believe you will be completely satisfied with our quick and reliable service. All orders are dispatched as swiftly as possible! Buy with confidence! BBC Books. Paperback. Used; Good. **WE SHIP WITHIN 24 HRS FROM LONDON, UK, 98% OF OUR ORDERS ARE RECEIVED WITHIN 7-10 DAYS. We believe you will be completely satisfied with our quick and reliable service. All orders are dispatched as swiftly as possible! Buy with confidence! BBC Books. Used - Very Good. Ships from the UK. Great condition for a used book! Minimal wear. 100% Money Back Guarantee. Your purchase also supports literacy charities. BBC Books. Used - Good. Ships from the UK. Shows some signs of wear, and may have some markings on the inside. 100% Money Back Guarantee. Your purchase also supports literacy charities. London: Book Club Associates in association with BBC, 1987. Book Club Edition . Hardback. Very Good/Very Good. 8vo - over 7¼ - 9¼" tall. Book Club edition. Octavo hardback. 200 pp. Colour and black & white illustrations. Very Good condition in Very Good unclipped dust jacket (corners rubbed). No inscriptions. BBC, 1992. This is an ex-library book and may have the usual library/used-book markings inside.This book has soft covers. In poor condition, suitable as a reading copy. Bbc Book Pub. Hardcover. 0563488212 Minimal signs of wear. . Good. 2002. BBC Consumer Publishing. Paperback. GOOD. Spine creases, wear to binding and pages from reading. May contain limited notes, underlining or highlighting that does affect the text. Possible ex library copy, thatâll have the markings and stickers associated from the library. Accessories such as CD, codes, toys, may not be included.